Today we announce the release of analytics for Scholastica Open Access Publishing. Journals will now have access to article usage insights including top performing articles, download counts, referring websites and more. Read on for more details! Publishing a successful academic journal means producing articles that are highly relevant to your target audience and reaching as many interested readers as possible. But how can journals know what steps to take to reach these aims? A big part of it is gathering publishing data. Journals need answers to questions like, “which are our most viewed articles?” and “what websites are our readings coming to the journal from?” In traditional print publishing gathering this information wasn’t always easy, but publishing online opens a new world of analytics tracking potential. Scholastica is helping journals tap into key publishing data with the release of analytics for Scholastica Open Access Publishing. Journals using Scholastica Open Access Publishing will now have access to insights around article usage, top viewed journal webpages, reader origins, and growth in readership. Scholastica’s publishing analytics offer a simple and straightforward way to track article performance, without having to learn how to use Google Analytics or other more complicated analytics software. 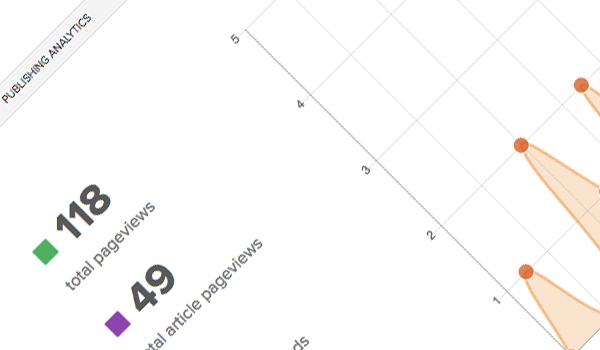 Here’s a look at the new publishing analytics. With Scholastica’s new publishing analytics, journals using Scholastica Open Access Publishing will have access to key website and article performance insights. Journals can use these insights to guide publication planning, from determining the next best special issue topic to deciding what to blog about more. Additionally, journals can use analytics to provide added value to authors by sending authors updates when their articles receive a significant number of views or download counts. It’s one thing to ensure that your journal pages are getting visitors, particularly to newly published articles. But it’s also vital to know how many of your pageviews are coming from the same people and how many are from new visitors to your website. Editors at your journal likely view your final published articles multiple times as do the scholars referencing them. You want to be sure that those recurring visitors aren’t skewing your readership data. We’ve included “unique pageviews” in Scholastica Open Access Publishing analytics to help you keep your readership counts straight. “Unique visitors” are people coming to your journal articles or pages for the first time. They are counted only once. So while you may have 1,000 pageviews, your unique pageviews could be 500 due to some of those general pageviews coming from returning readers. Unique pageviews allow you to home in on the true number of readers coming to your journal pages for the first time. A big question for journals is whether their scholarship is reaching a global audience and which online channels are attracting the most readers. We’ve included two helpful sections in Scholastica Open Access Publishing analytics to help you answer these questions. 1. Readers by country: Now journals can click “Countries” on the analytics page to see where their readers are based, geographically, and help determine where they need to work to expand their reach. 2. Referrers (sites that are linking to you): Your journal can dig even deeper into where readers are coming from with the analytics “Referrers” tab. Referrers are websites that lead visitors to a specific webpage. For example, if your university library writes a blog post highlighting one of your journal articles and a reader clicks a link to the journal article in the blog post, the university library blog post that led the reader to the article would be considered the referrer. Your journal can use referral information to see who is talking about and linking to your research online and track the success of your marketing efforts. How cool is that?! The new publishing analytics provide journals with a window into the relevancy of their content and how well their publication website is working. Using Scholastica Open Access Publishing, all journals are able to create a custom publication website with mobile-friendly pages and enhanced discoverability among other features. With publishing analytics, journals can track readership activity on their modern website to help inform their publication decisions. Want to check out Scholastica Open Access Publishing firsthand and see analytics in action? Request a demo of Scholastica Open Access Publishing to get a quick tour with a member of our team. New features to help you tailor your journal's peer review and publishing process, including: reviewer tags, Digital Object Identifier metadata, and custom journal subdomains. We've introduced updates to make it even easier for readers to find and view relevant content from Scholastica journal websites, as well as the ability to add ORCIDs to articles.